Titanium is a lightweight, hypoallergenic, non-tarnishing metal that a third generation jeweler and artist named Edward Rosenberg introduced into the fine jewelry industry during the 1980s. Since that time, titanium jewelry has experienced a dramatic rise in popularity. 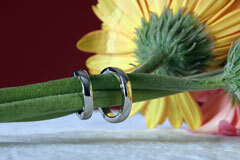 Titanium rings have several advantages over rings made from other metals. Titanium is harder than gold, silver, or platinum, its finish doesn't tarnish, and it provides the rich grey tones of platinum at a much more attractive price. Furthermore, titanium is an inert metal that won't discolor your skin. For these reasons, titanium is often preferred for wedding bands, engagement rings, and other stone setting rings. There are many different grades of titanium jewelry on the market. 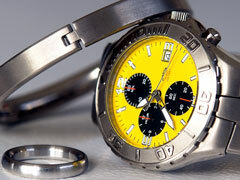 Most titanium jewelry products are made of some type of titanium alloy rather than pure titanium. Many titanium rings being sold today are made from Aircraft Grade Titanium, a very hard metal alloy made of titanium alloyed with aluminum, vanadium and tin. Aircraft grade titanium rings are difficult to engrave and refinish, and they may be difficult to remove in an emergency. Because of such concerns, the World Titanium Council does not endorse aircraft grade titanium for use in titanium rings. The most popular commercially pure (CP) grades of titanium are grades 1 through 4; CP Grade 1 is the softest and Grade 4 is the hardest. Some jewelers consider CP Grade 2 titanium to offer an ideal balance between hardness and workability. It can be cut, refinished, and engraved, yet it polishes well and resists marring. Whether you are familiar with titanium jewelry or not, we think you will enjoy browsing the titanium jewelers listed below. Collectively, they offer an exciting selection of titanium ring and jewelry designs. This jewelry design house specializes in unique made-to-order titanium wedding rings, diamond engagement rings, gold and platinum inlaid wedding bands, and titanium accessories. 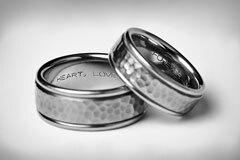 Titanium Style, an Ohio-based firm, designs and produces wedding sets, jewelry, and custom rings for women and men in titanium and precious metals. Georgia-based ring maker offers a complete selection of titanium rings including exclusive Hardwood Inlay and Executive Series rings. This organization provides information, knowledge, and experience throughout the titanium industry. It serves as a catalyst to expedite the development of new products, industries, and applications in titanium. Provides training, support, technology and manufacturing for a vast array of titanium products, including The Edward Mirell fine titanium jewelry collection.